RBTH presents a selection of views from leading Russian media on international events, featuring analysis of the deteriorating relationship between the United States and Israel and its repercussions for Russian relations with Tel-Aviv, as well as a report on the CSTO’s failure to establish ties with NATO, and the assessment of a Russian academic on U.S. relations with Iraqi Kurdistan. The Gazeta.ru publication reports that the U.S. administration is continuing to put pressure on Israeli Prime Minister Benjamin Netanyahu, whose policies it considers damaging to the peaceful regulation of the Middle East. The friendship between the long-time allies, according to the publication, is under a serious threat. The control that the Republicans now have of both houses of Congress may strengthen the position of representatives of the Israel lobby among right-wing conservatives. However, the White House intends to put further pressure on Tel-Aviv. In the view of many international experts, it is the U.S. that is to blame for the collapse of the peace process. Secretary of State John Kerry was not able to achieve the start of a serious peace process after having stopped the intensive phase of the Palestinian-Israeli conflict, writes the publication. Gazeta.ru reminds its readers that the U.S. is still the main guarantor of Israel's security and dedicates $3 billion to this annually. The friction between the two countries is now seen even in the military field. Moreover, Washington has threatened to stop supporting Israel in the UN, in particular, to stop blocking anti-Israeli resolutions. Gazeta.ru writes that, according to Israeli political analyst Avigdor Eskin, Russia may profit from the cooling of American-Israeli relations. 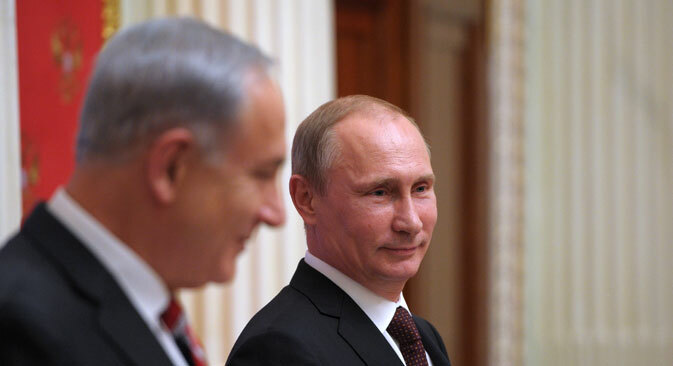 "The good relations that Netanyahu has with Putin are commensurate with the complete incompatibility between Netanyahu and Obama," said Eskin. The Kommersant newspaper reports that the Collective Security Treaty Organization (CSTO) is ceasing its attempts to establish relations with NATO. The newspaper reminds its readers that the CSTO, an intergovernmental military alliance of former Soviet states, tried approaching NATO on several occasions in the last several years. The last time was in 2012, when foreign ministers from the CSTO countries approached the alliance with the intention of establishing cooperation, saying that it was necessary to confront contemporary challenges and threats with mutual effort. However, according to the newspaper, NATO did not respond to the call, just as it had not responded earlier. A Kommersant source at NATO headquarters explained that the alliance sees no "important reasons that would make it worthwhile for NATO and the CSTO unite institutionally, since NATO already cooperates rather efficiently with the CSTO countries on a bilateral basis." Citing CSTO Secretary General Nikolai Bordyuzha, Kommersant writes that now the organization will start developing interactivity with the OSCE (Organization for Security and Co-operation in Europe) and SCO (Shanghai Cooperation Organisation), and will strengthen its cooperation with China, Iran, Latin America and the Caribbean countries. Bordyuzha blamed the NATO countries for trying to destabilize the situation in the CSTO countries, writes Kommersant. Nezavisimaya Gazeta has published an article by Stanislav Ivanov, a leading academic from the Institute of World Economy and International Relations and the Institute of Oriental Studies at the Russian Academy of Sciences, who analyzed relations between the U.S. and Iraqi Kurdistan. Ivanov underlines that U.S. Secretary of State John Kerry's announcement regarding the Iraqi Kurds, in which he said that, "It is still too early to recognize Iraqi Kurdistan as an independent state," met with a stormy reaction in the world media. Kerry also stated that "it is necessary to solve one problem at a time" – interpreted by Ivanov as meaning that the Kurds will first be used in the fight against Islamic State (ISIS) jihadists, and only afterwards will their fate be decided. Ivanov believes that Washington is still trying to create a “Big Middle East,” in which there is no room for a Kurdish state. However, the artificial creation of a new Iraqi state was unsuccessful, just as American attempts to create even a semblance of a coalition government in Baghdad also failed. In the current situation the Kurdish regional government is obliged to look for safe forms of existence and state organization. In these conditions the Iraqi Kurds have no choice but try and create their own statehood, writes Ivanov.